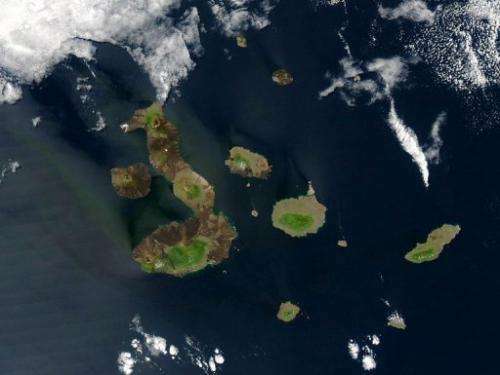 This true-color NASA satellite image released on August, 22, 2004 shows the Galapagos Islands, which are part of Ecuador, located in the Pacific Ocean. Google has followed in the footsteps of Charles Darwin to gather images of the beauty and biological diversity of the Galapagos Islands for the Internet titan's online maps. Google has followed in the footsteps of Charles Darwin to gather images of the beauty and biological diversity of the Galapagos Islands for the Internet titan's online maps. A Google Maps team toting 360-degree cameras sticking from backpacks hiked trails, hills, and even into a live volcano to take Street View pictures of the precious environment where Darwin gleaned insights for his theory of evolution. "We were in a boat on choppy waves; clambering over lava rocks, and on horseback up the side of a volcano," Google Maps project lead Raleigh Seamster told AFP on Thursday. "There were a lot of adventurous times. It was very inspiring." The Street View team spent 10 days on the islands working with the nonprofit Charles Darwin Foundation (CDF); Galapagos National Park Directorate, and Catlin Seaview Survey. The CDF had reached out to California-based Google to add images from the Galapagos Islands to Google Maps to let people virtually explore without treading on the fragile ecosystem and as resources for research and education. "This is a unique opportunity to spearhead technology science for conservation and public awareness about the importance of Galapagos ecosystems in a changing world," CDF head of research on human systems Daniel Orellana said in a release. Catlin Seaview Survey used special photography gear to collect high-definition, panoramic images in the waters of the archipelago, which is listed as a United Nations World Heritage Site. "We have compiled an amazing portfolio of 360-degree images that will allow the world to take 'virtual dives' in the Galapagos Marine Reserve's unique ecosystems," said Darwin Foundation head of fisheries Pelayo Salinas de Leon. Underwater images will also be used as baselines for gauging the health of the marine system and the effect of climate change. Google engineers are weaving imagery into immersive Street View scenes that will be added to its free online mapping service later this year, the company said in a blog post Thursday describing the project. "They picked a very diverse set of places, from some that tourists visit quite often to locations that are off-limits," Seamster said. "We had to hike across four kilometers of lava fields to get to a spot where land iguana restoration was going on," she continued. "We were able to get very close to animals." The project marked the first collection of Street View images in Ecuador, according to Google, which has ranged to places such as the Amazon in Brazil and the Canadian Arctic to get pictures for online maps.